Our doctors at InFocus Eyecare are currently qualified and licensed to follow and monitor the ocular manifestations of diabetes, high blood pressure, macular degeneration, and cataracts. Furthermore, our doctors are licensed to issue prescriptions for medications in the treatment of dry eyes, ocular allergies, ocular infections, and glaucoma. 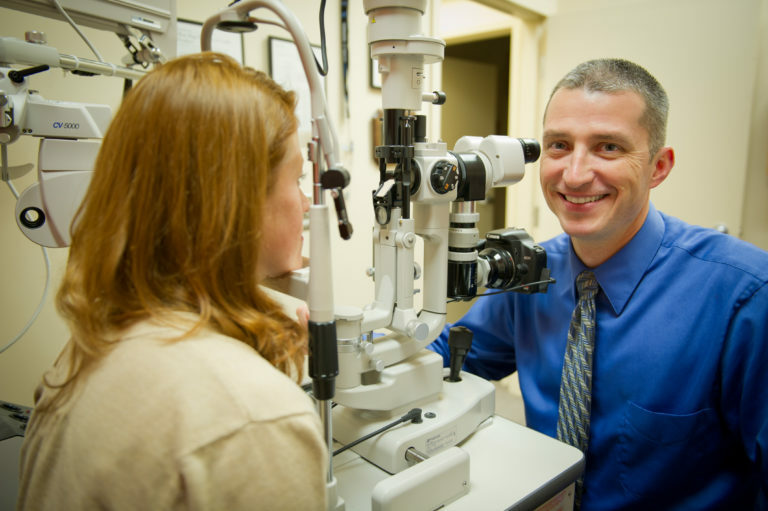 Our doctors also determine the best spectacle correction to correct your vision and provide the prescription for glasses and contact lenses and determine if there may be issues in the visual system and the best way to correct the issue. Today’s eye exam is an interactive partnership between the doctor, and the patient. We rely on the accuracy of patient responses to provide the most comprehensive examination. In order to identify all of your needs and any potential health problems, we ask that you complete a health survey to provide a more complete historical and current health record. It is said that the eyes are the gateway to the body and in many cases this is completely accurate. Many medications, vitamins, and foods can all influence the health of your eyes and your vision. Additionally, many diseases can be observed by examining the health of the eyes. Several common examples include heart disease, high blood pressure, diabetes, infections, auto-immune disease including AIDS, or stroke and brain damage, and certain types of cancer. For these reasons it is very important to have regular eye exams to dilate the pupils.